I have great pleasure in starting my monthly chat by saying how proud I feel to be the Chairman of such a great club. The Swap Meet which is our main source of income was a huge success and why? Because the whole club was behind it! It was run by a club that is committed to each other. Sure we had all the main organisers who put a huge amount of time and effort into the event from behind the scenes. These people are far too many to name but if the club had not been behind them the event would not have been so successful. So thanks and congratulations to you all, this commitment is what a club is all about. Let’s just keep it that way, combined, dedicated and with friendship. On Saturday 30th March we had our visit to the Masonic Village in Levin and again it was such a pleasure to have 14 cars participate and enjoy the gratitude and pleasure that we gave as a club to the occupants of the village. The weather was magnificent and after taking many of the residents for a ride we were all treated to a wonderful afternoon tea served on the lawn under the trees. The management of the lodge told me that it was 25 years since the club had been there and requested that we make the event at least an annual one. Again our reward was seeing the look on the faces and realising the enjoyment our club was giving the residents. So thanks to all those that attended. This month’s club meeting was well attended with about 60 members present. Bill Isles presentation on the Wanaka air show was well received, so thanks Bill and your assistant Colin Geange. Next month’s speaker is Bruce Hutton. Bruce collects old post cards so his presentation will be very interesting. This month’s Saturday morning Working Bee was very well attended and there were also quite a few visitors there, so again we all enjoyed a very social morning. Anyone is very welcome to attend this monthly occasion and it is a great opportunity to look through the Spares department or the Library and enjoy our super social morning tea. Our next event is the Ted Green Motorcycle Rally on the 14th of this month and then on the 28th is a competitive afternoon run organised by Bruce Lawrie so I hope to see you at these events. Cheers. Speaker for May 2019 An out of the ordinary collection will be shown by Bruce Hutton QSM. He has many varied interests and will speak on another of his passions. The April monthly run will be an interesting and well run event with Bruce Lawrie at the wheel organising the day. This will be a competitive run without timed sections and will have concluded within two and a half hours. This will be run rain, hail or snow as the weather wonâ&#x20AC;&#x2122;t affect your attendance. It is suitable for all cars. Have lunch before you attend. Meet 12.45pm at the Kapiti Freemasons Centre Waikanae. This is above the Olive Grove CafĂŠ in Marae Lane Waikanae. There is plenty of parking available in the shopping centre carpark. There is a lift available for those not wanting to use the stairs. The run briefing will be held in the Freemasons Centre. First car away approximately 1.15pm. At the conclusion there will be afternoon tea available at the Freemasons Centre. Gold coin donation please? If you wish, you can take part in a guided tour of the Lodge premises. This will be a very pleasant Sunday afternoon. The Levin RSA has invited the Horowhenua Branch of the VCC to participate in their 100 Years celebratory Parade. This is to be held on Saturday 11 May commencing from the Levin Mall carpark. Assemble at 10 30 am. 10 to 15 cars are required please? Carpark is opposite New World. Wrestle the old car off the old man and give this run a goâ&#x20AC;Ś. The run has been set by ladies, with the ladies in mind! Held in the Levin area. Everyone is encouraged to attend. BYO lunch, bring gold coins for entry to points of interest. Depart club rooms 9.45 am. The mid Winter dinner is on again. Meet and greet at midday. Dinner served approximately 1 pm. Please pay at the time you register. Register by emailing Rex Williams rexandbrigid@gmail.com or speak to the Club Captains. Pay by cash or internet banking. A/c No 03 0667 0269227 00 quote your „Surname‟ and event „MWinter‟. Payment must be made before the dinner, no door sales for catering purposes! Cutoff date 11 June. Talk Electrical Ltd have installed exterior speakers on the Flour Mill. We now have a wonderful sound system for our events. With some labour assistance from our club the Manager of Talk Electrical has spent several hours doing the install. There has been NO CHARGE to the club with the exception of materials. A very generous gesture! Please remember Talk Electrical for your electrical requirements. A competitive run in the Kapiti area organised by Bruce Lawrie. MAY ACTIVITIES 12 May The Ladies Run. To be advised. Prizes up for grabs. JUNE ACTIVITIES 16 June The Mid Winter Christmas Dinner. Midday meet and greet. JULY ACTIVITIES 14 July The Night Owl Rally. Arrive 7 pm at the club rooms. A pot luck supper this year. Please bring a plate. Hope to see heaps of bikes on the Ted Green, then on the Kapiti run. Thanks for all your support. Coming in through the gate at 8am was a Ford Single Spinner Coupe with lovely light blue paint work with a light metallic fleck. There were three blokes in the car. They pulled up to pay. The guys in the front seat paid up. Barry bent over to check the back seat passenger. There was no money forth coming. He had to ask if he was alive! The others poked and woke him, with a start and in a sleepy stupor he paid his money. The driver apologised, he said they had left Auckland early this morning and they had been rotating the driver while the passengers slept! Good effort! A punter through the gate already has his $5 note held up ready to pay, as he hands it over, he says “cheapest Swap Meet around and one of the best”. Just a simple wee query at the gate was made, “Are you selling or just having a look around” so as to establish what to charge. The bloke says “Mate the only thing I can sell you is my wife, she’s sitting right here, how much can you pay?” He got thumped! A friendly old chat with a fellow VCC member from another branch ended up turning to the cost of entry to the Swap Meet. His opinion was that the cost ought to be raised in line with similar events run by other branches. We apparently are selling ourselves short and there is more money out there for the club. Interesting that other branch members find it necessary to advise us on how we should run the Swap Meet! “I wish you guys had a pass out stamp, then I could get back in without having to find the guy who I told, I was coming back! It would make it a whole lot easier!” Several comments were received from members of the public that the food selection was excellent. There was a good variety and it was good quality. The cost of the food was very reasonable as was the gate charge which is regarded as very good. The remark was overheard that this is a great Swap Meet and has to be No1 in the area. This is the one not to miss. It helps that the attitude of the members is friendly and helpful. The comment made to Mike Khull by a keen member of the public was that he was happy there were plenty of seats and tables. He said it was good to be able to sit down and rest, have a cup of tea and eat. It was a good place to talk to your friends. He also said the deck was a nice place to sit and get out of the sun, you could look at the goings on. The comparison was made to Palmerston North where it was difficult to get a seat and you were on your feet the whole time. This year’s Swap Meet was better as it was more spread out. It was easier to move around and walk between peoples’ sites. Ordinary bloke, bit of a hard case is up to the gate by himself. He turns looking for someone and no one is there. He goes looking and his wife arrives around the corner, wearing gumboots. He reckons she’s got the money, she says he has! He checks his pockets and yep it’s in his pocket. His wife kicks him up the bum! After a look around he’s back at the gate wanting to put stuff in his car, he says, normally he wears a red hat to recognise him by, to get back in. He says look at the Mrs, she’s got a red jersey. He says you can’t miss that, besides look at the size of her, you’ll remember us. His wife kicks him up the bum! Couple of fellas walked into Spares when it opened at 10am. One of them stops short and says out loud “S*+t this is like walking into a supermarket!” Spares guys commented by saying that’s exactly what we set out to achieve! 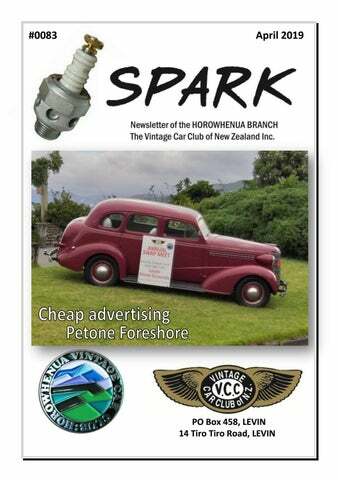 REPORT ON THE EXECUTIVE MEETING OF THE NZ VINTAGE CAR CLUB HELD ON 23 MARCH 2019 AT THE MIRAMAR GOLF CLUB, WELLINGTON The meeting started at 10am and finished at 5pm. The Executive is made up of a delegate from each Branch and all but 4-5 branches were represented. The Executive is the decision making body for the Club. The financial performance for the 10 months ended January shows a surplus of some $69,000. The profit share from Vero was around $37,000 about $8000 up on last year. Vero ‘s contribution to the VCC is around $1million dollars including sponsorship since 1963 originally as Phoenix Insurance. Membership Papers had been circulated re membership for each branch covering new, deceased, resigned and un-financial members. The reason for this is the executive committee is the body that approves new members not the branch committee. A person applies to join the club and not the branch. Likewise expulsions can only be done by the executive committee. There is work being done on an online membership application form. I asked if the application form could ask whether new members wanted to receive an electronic or paper copy of Beaded Wheels as people under 50 years of age do not read daily newspapers let alone paper magazines. The magazine is sent out electronically to non members. George Kear has been appointed to the management committee. The first National rally for vintage cars is to go ahead in 2020. Probably start in Taihape and go over to Napier and down to Central Hawkes Bay. The NZTA’s problems with heavy transport and WOF issuance is not helping the cause of 12 months WOF for Historic vehicles which is not making any progress. Planning is proceeding for a ‘highland frolic’ in the North Island modeled along the lines of the Irishman rally for 2020. Maybe located in the Taihape inland Hawkes Bay area but route not yet finalised. Archivist in Christchurch has 1000 books in the library and converted to a free library software called book tome which gives information on title, author, year published, no of pages and locations where the book maybe held. Can contact Archivist for further information if required. Horowhenua Letter The President read out a letter from the Horowhenua Branch seeking to have our Southern boundary, currently the Waikanae River extended southwards to just South of Paekakariki where the Kapiti Coast District Council ends. A copy was also sent to Wellington branch. The President asked the 2 branches to talk together and come back to the next executive meeting. The issue is significant to us as we seek to lift our profile in the Paraparaumu area but more importantly it was drawn to the meetingâ&#x20AC;&#x2122;s attention that members living outside the branch boundaries are not eligible to hold office in the branch. This disenfranchises members who live south of the Waikanae River. Auckland branch said they would also have a problem with North Shore and Waitemata branches members living outside their boundaries. Upon further investigation, subsequent to the meeting it was found that is not the case unless stated in the Branch Constitution. Branch Constitutions National Office sent out a template constitution for branches to use if they wish. A number of the branch constitutions are badly in need of revision. The Incorporated Societies review could be ready for introduction into Parliament this year with a view to being enacted next year. It would seem prudent for the Branch to await the enactment before making changes to our constitution. National Motorcycle Rally In view of the International Festival of Motoring being held in 2021 it had been decided to not hold other national rallies in that year and the motorcycle rally would be part of the festival rally. There was considerable opposition from branches and it was resolved without dissent to allow the national motorcycle rally to proceed in 2021. There were 189 entrants in the 2018 National motorcycle rally while just 9 entries in the Dunedin International Rally. Wairarapa branch indicated they were interested in holding the motorcycle rally in 2021. 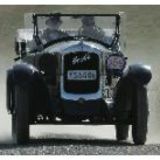 Targa Rally In 2018 was in Southland, usually in North Island. Organisers were happy with VCC entrants and the Club received 22 new members. This year the rally is from Rotorua to Palmerston North over Labour weekend. Aston Martin has revealed that it has already secured buyers for the entire run of the James Bond DB5’s. They will cost £2.75 million each, and cannot be used on the road! The cars will be built from scratch with the features as on the eight Bond movies, bullet shield, revolving number plates etc. A total of 28 will be built, with 25 being sold preordered, two for display and the other to be auctioned. JLR Classics in England are rebuilding Series 1 Land Rovers. Rebuilt using an ‘old chassis’ with as many new components as possible, still featuring the old 53hp 1.6 engine. Price £75,000. Range Rover is also ‘restoring’ using the same process. Price £140,000. This includes the E type Jaguar at a whopping £275,000. Orders any one? 1980 â&#x20AC;&#x201C; The Tararua Trundle A young Brendan Fox dressed to impress, with Dad Stewart giving the 1911 Ford Model T a last minute adjustment. Taken outside the old club rooms. The Tararua Trundle at Mangaone 1988. Organised by Stewart Fox (Chairman), who unbelievably passed away one day before it was run. When insuring your valuable items (property, car etc) with Vero, quoting this number results in a commission being made to the Horowhenua Branch. Thank you for your support. ______________________________________ _________________ SUNDAY RUN – 28th April 2019. Meet at Chesters Plumbing and Bathroom carpark in Tremaine Avenue (Palm Nth) at 1.00 pm for a drive on easy roads to a Café. The total mileage for the afternoon (i.e. including back to Palm Nth) is approx. 50 miles (80 Kms). Complete the form that is in this Tourer and mail it to the address on the form. If you would like the form emailed to you so that you can avoid having to cut into your Tourer, email the Rally Organiser requesting that a PDF version be emailed to you. Alternatively forget the form and just send an email to the Rally Organiser with all of the details that are requested on the form included in the email text. Send a cheque in the post with your entry form. Email the Rally Organiser requesting account details so that you can pay by internet banking. Rally Organiser: Bryan Abraham - phone (06) 358 4014 Rally Organiser email: bryana@xtra.co.nz Entries Close: Saturday 27th April 2019. The Swap Meet was a record day on many fronts! I’m sure there will be many write ups in this issue of Spark. This Spares report takes place before the Swap Meet. There is nothing like a “barn find” every once in a while. On a somewhat wet Wednesday morning four days before the Swap Meet, Bob, Colin, Des and myself set out to rescue a 1937 Wolseley 12. It had been up on blocks since 1983 and is a former Waikanae car. The rain was only the start of our problems. We faced barbed wire, seized brakes, waist high grass and rats! We started at 10.30am and finished at 1.20pm. Along with the Wolseley we recovered some 1920’s Crossley 19/6 parts and a complete set of Austin 20 wheels. There were also two 21 inch Morris Commercial pressed steel wheels. Was it worth all the trouble? Yes! The Wolseley 12 sold on Swap Meet day along with the Austin wheels and Crossley parts. The Wolseley will be fully restored in the Manawatu area. Safe travelling everyone. 1920 Crossley 19/6 chassis. 1,150 19/6’s were built between 1920 to 1926. 1937 Wolseley 12 5,602 Series III vehicles were built. This car was sold to the Manawatu area. One of a complete set of Sankey wheels from an Austin 20. $ 4 $ 3 $10 $12 For Sale on behalf. Body shell of 1936 Austin Seven Ruby. Very good condition cleaned and primed. Small amount of panel work to do. Has metal turret top. Some wood work. No dash or instruments. Sale includes door shells, spare wheel cover, windscreen assembly, wiper and full set of mudguards. Extra two front guards. New running board rubber left and right. $950.00 or near offer. Contact: Peter Nightingale 06 3687160 evenings.